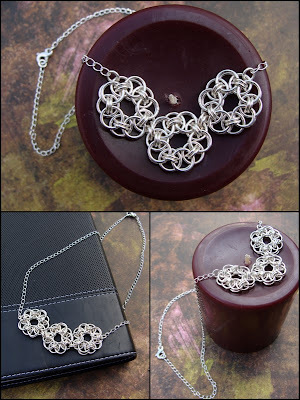 This necklace is made using the Helm/Parallel Chainmaille Weave weaved into 3 flowers. I used sterling silver wire for the 75-18 gauge jump rings. I then added the flowers to a sterling silver Long Curb Chain and used a sterling silver Figure 8 clasp to finish it off. Full length is 18 1/2". All my sterling silver jump rings are tumble polished for a beautiful shine and strength.